Innovative Foto is the largest manufacturer, operator and distributor of digital imaging photo booths in the United States with 2,400 booths operating nationwide. Its fleet, installed in malls, retail stores, movie theaters, and hundreds of other consumer destinations, yields tens of millions of customer interactions annually, and is seen by millions of passersby each month. 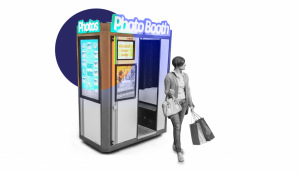 Innovative Foto’s booths feature a 43 (37”Tall x 21”Wide) inch screen on the outside of the unit, showing messages to entice consumers to engage and interact with the machines. In 2017, Innovative Foto started collaborating with Quividi to measure and classify the audiences around their units and hopefully better convert them into sales of photo strips. Innovative Foto wanted to understand the audience traffic at a selection of locations to confirm the messaging was enticing and resonating with the audience. They ran a two-week test where they analyzed the audience around the booth and then compared it to the purchasing and interactions times within the booth. With the audience data from week one, Innovative Foto had the goal during week two, to optimize the creative content played on the screen to better target the audience that was around the booth. This would be measured by tracking the changes to the attraction rate and measuring any impact on purchases. The results were impressive: Innovative Foto increased retail purchases at their vending machines by over 24%. Innovative Foto and Quividi produced a report detailing the initiative, which can be downloaded here. Innovative FOTO is an international supplier to distributors and operators in over 30 countries. Innovative FOTO is a wholly owned subsidiary of DNP Imagingcomm America, a wholly-owned U.S. subsidiary of Dai Nippon Printing Co., Ltd. This entry was posted on Thursday, April 12th, 2018 at 00:05 @045 and is filed under DailyDOOH Update. You can follow any responses to this entry through the RSS 2.0 feed. You can leave a response, or trackback from your own site.